Monday, December 20th 2010: 6 miles @ 10:37 per mile pace. Wet and cold. 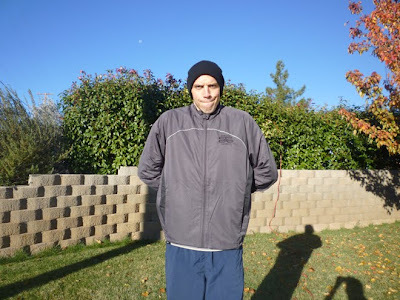 Tuesday, December 21st 2010: 4 miles @ 9:57 per mile pace. Another soggy run. We had a five-day storm during which we received almost DOUBLE the amount of rain as our area averages in a whole YEAR. 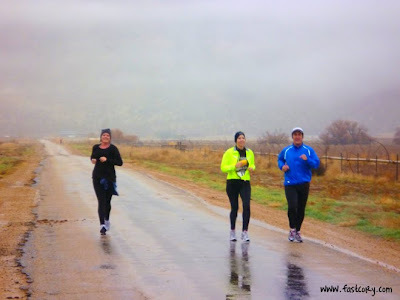 I read an article in Runner’s World which mentioned a doctor makes a point of running during a “weather event” because it makes him “feel acutely alive”. I thought about that article while I was running this week. This was certainly a “weather event”. 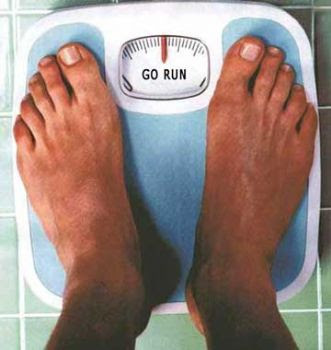 Wednesday, December 22nd 2010: 16 miles @ 10:48 per mile pace. 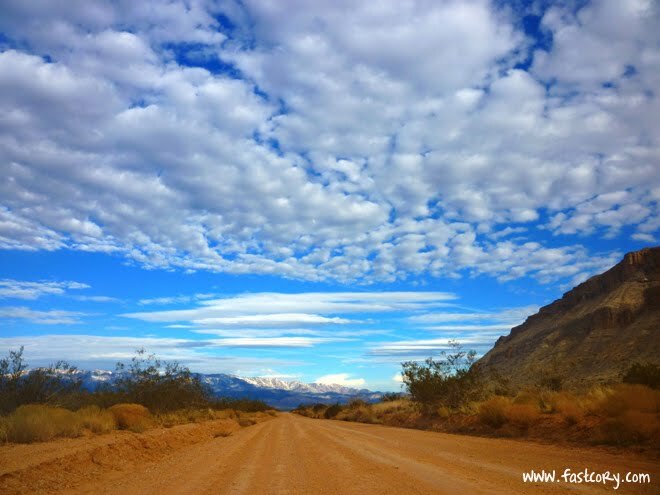 A spectacular thing happened Wednesday: it stopped raining for a few hours during the first part of my run. I was so thankful. But it was very windy. It made me laugh when I’d look up and see birds flying into the wind and flapping their wings like crazy but not moving anywhere. But then when the wind picked up even more, I felt like one of those birds too: hard effort but still running in place. Thursday, December 23rd 2010: 4 miles @ 11:20 per mile pace. This was the first time I had run with Mel in quite a while. We went later at night but probably still too soon after dinner. Ugh. That potato soup was begging to come back up. Friday, December 24th 2010: 11 miles @ 10:55 per mile pace. 11 miles seemed so much easier than 16 a few days prior. 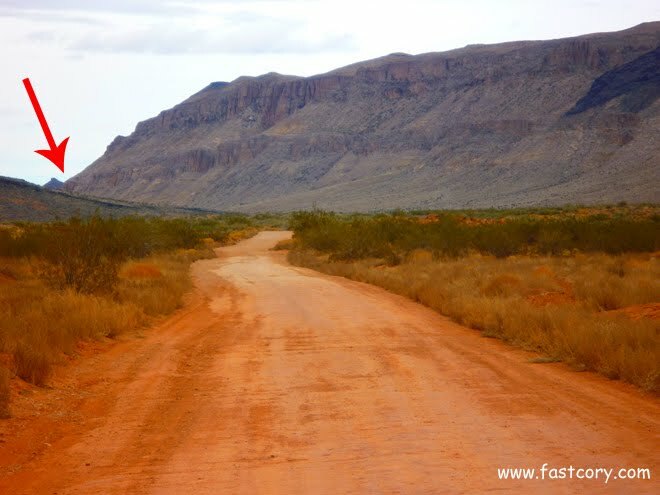 I did the first half of the run with Mel on the Arizona Strip dirt road. This was her first time here and she was slightly freaked out by all the cows. It could have been the making of a horror movie. 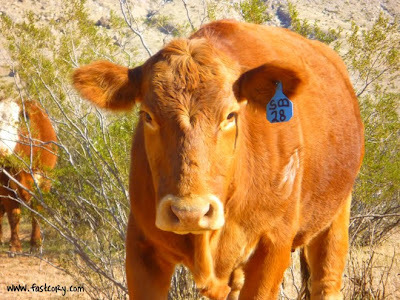 You are happily running down a dirt road when suddenly you are surrounded by a herd of snorting, scowling cows who seem royally ticked off that so many of their family members have become Big Macs. Who needs Silence of the Lambs when you are surrounded by a group of cattle? Saturday, December 25th 2010: Rest – Merry Christmas! I guarantee my 41 miles this week are still not enough to justify all the junk food I have eaten. My self-control with sugar has definite room for improvement. 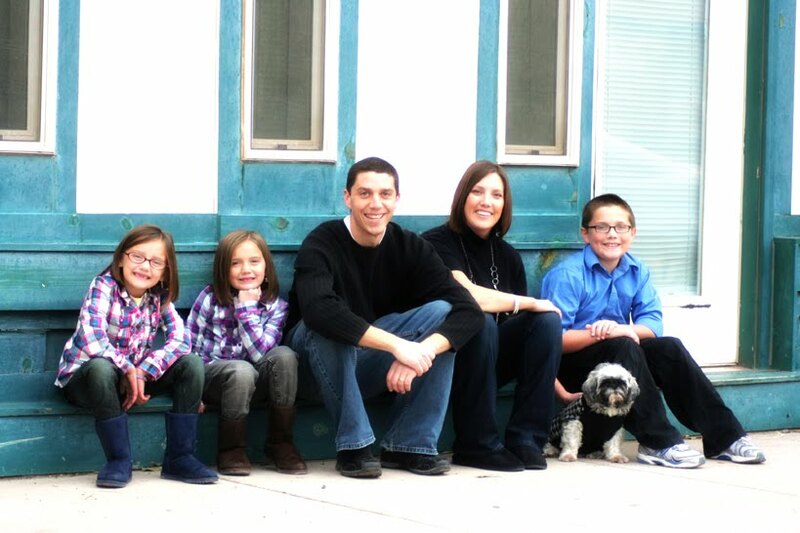 Merry Christmas from the Reese family! I find it difficult to summarize our awesome year into a few pages. I could be brief and say that we ate lots of snow cones from SnoKaps, and that I recently discovered the heavenly attributes of carne asada French fries from our local Mexican restaurant. But alas, much more has happened. The kids all have excellent teachers and love school. Our children have even managed to enjoy chicken drumsticks when they have hot lunch, whereas for the average adult, just the sight of these drumsticks would cause dry heaves. They all enjoyed swimming lessons during the summer and have gone positively NUTS with the piano. The girls had fun taking gymnastics lessons this year and Jackson stays busy with scouts. One highlight of the year was a trip to California to visit Sea World and Lego Land. The worst part of the trip was the flock of birds that lived outside of the windows. They had no concept of “bedtime” and enjoyed chirping at ear-piercing decibels all night long. Mel and I also went to Hawaii in March with two other couples and had a blast. I ate so much pineapple that my blood started to turn yellow. Mel and I continue to work in the primary at church. Spending time with the kids is great. But I do have one beef with the primary room: the temperature always hovers around 638 degrees. I swear you could put some cake batter in there and have a beautifully cooked cake 30 minutes later. Mel works a night a week at the hospital and also helps out a little bit at an assisted living facility. She is still very beautiful. She ran her first marathon this year – the Park City Marathon. 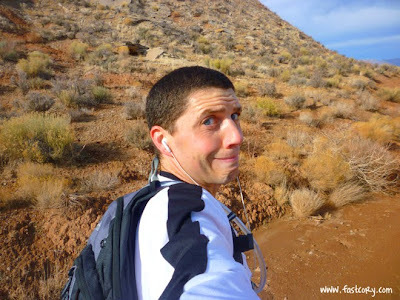 Then ran a second – the St. George Marathon! At the expo before the race, we sat next to a guy who was 80 years old and running the marathon. I asked him what time he was shooting for and he said around 6 hours and 15 minutes. Mel said “Cool, give me props!” and she held out her fist for props. He just sat there and looked at her. I nudged her to put her hand down NOW! An 80 year old IS NOT going to know what it means to “give you props”. 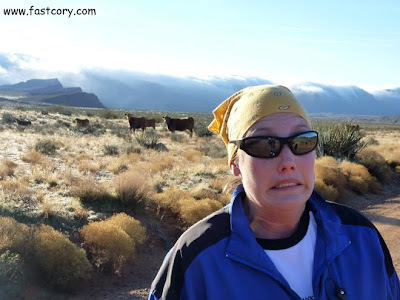 And then, right before the St. George Marathon started, Mel stepped in a pile of human poop. It sloshed out the holes of her shoe. I believe I earned some Husband Bonus Points for running next to her for the next 26 miles while I smelled her foot. I continue to my career as a social worker which keeps me busy. 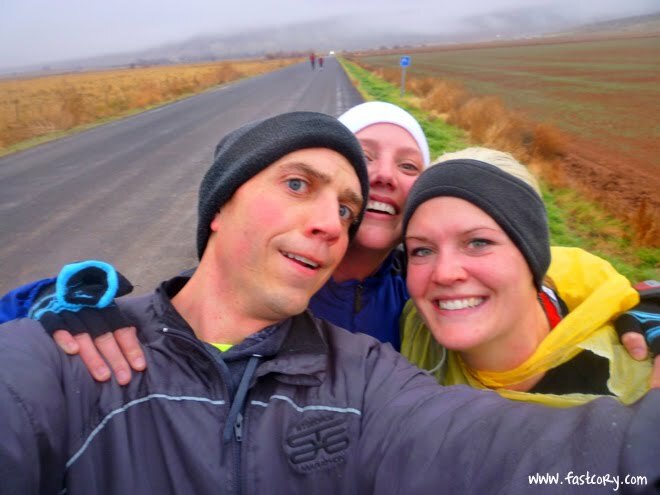 I managed to run 5 half marathons and 5 full marathons this year and am looking forward to a race I organized coming up next week: the Hostess Half Marathon. 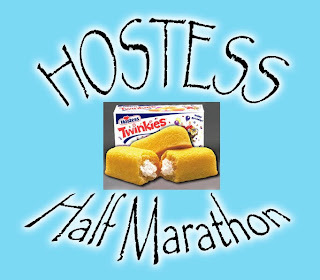 Runners must eat a Hostess product every two miles of the race. Registration filled up quickly and I’m certain there will be some barfing along the way. 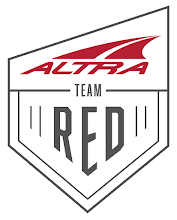 I signed up to run my first ultra-marathon (50 miles) coming up in March. January 4, 2010: So a few minutes after I tucked the girls into bed, Danica came down sobbing. She was crying hysterically. You’d have thought someone died. I asked her what was wrong and she said that her tooth got lost in the carpet and she couldn’t find it. I asked how that happened. She explained that her and Kylee thought it would be fun to play catch with her tooth. Two throws later, the tooth was lost in the carpet. With our carpet, finding a tooth is like looking for a needle in a haystack. We looked and looked. She continued to sob the whole time. I heard her whimper “Are you serious?” as she searched the carpet in dismay. We never did find the tooth. Thankfully the Tooth Fairy accepted a note for this tooth also. At least she didn’t eat it, like the first tooth she lost. January 26, 2010: The Alzheimer’s conference I attended yesterday was at the Senior Citizen Center. 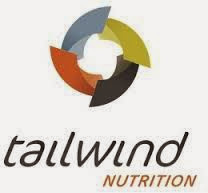 Unfortunately lunch was provided by the Senior Center. I was doing my best to enjoy the broccoli cheddar soup when I came across a stringy black hair. Suddenly I didn’t want anymore soup. So I started eating the turkey wrap. With the first bite, I bit into a long brown hair woven between the slices of turkey. Note to self: never eat lunch again at the Senior Center. April 26, 2010: We decided to take the kids to the Earth Day celebration in Springdale. On our way up, the kids asked if we could stop and see the ostriches. We agreed to buy a little bag of food for them to feed the ostriches and they were thrilled. Well, somehow Danica managed to grab the fence for a second. And a moment later she was running toward the car crying and screaming. I followed her to the car and she was bawling because she got bit. The guy who owns the ostriches happened to be out there and saw what happened so he brought the kids each a big ostrich feather. That got the tears to stop. Later she said that it scared her more than it hurt. I learned that it’s hard to show sympathy when you are laughing. May 21, 2010: Apparently at school Dani’s class was supposed to be walking around the track for some reason. According to Dani, her friend Kelsey called over to her to come and look at some lady bugs. So Dani went. And then they got in trouble from Mrs. McCombs for not walking around the track. She put Dani’s name on the chalk board to lose recess the next day. Danica came home from school distraught. I don’t think she gets into trouble too often so she was worried. She came home and wrote Mrs. McCombs a letter. It said something like “Dear Mrs. McCombs, I’m sorry I was looking at lady bugs. Do you forgive me? Yes or no?” She put it in an envelope and included a pack of Smarties. I asked her the next day what Mrs. McCombs said. She said that Mrs. McCombs forgave her and let her go to recess. June 1, 2010: On our drive home from San Diego…. One funny thing about the drive home happened when we stopped for lunch at Arby’s. Kylee looked out the window and said “Look at that mof!” We said “What?” She said “Look at that mof!” We asked her again and she said “Mof!” a few more times. We thought it was really cute. Danica was polite in enunciating “mothhhh” instead of “mof”. August 17, 2010: Jackson ran the Washington County Fair Mile Race. I was standing at the finish line talking to Shelly Thomas and we looked down the road and saw some runners coming. It was too far away so we couldn’t see any details, but Shelly said “It looks like the person in first place is wearing a black shirt. Maybe it’s Jackson!” I vividly remember the image of looking down the road seeing that black shirt and feeling unsure but hopeful. I remember the image so clearly because I thought to myself “That guy is going fast!” As the runners got closer I saw that it was Jackson – and he was in first place! It was really exciting. He ended up winning the mile race with a time of 8 minutes and 55 seconds! That is incredible. That is really fast! He won a ceramic plate and a $20 gift certificate from Classic Sports. I felt very proud of him for all his hard work. September 21, 2010: I decided to take the kids to SnoKaps Wednesday night which they were excited for. Jackson said “I really hope there aren’t other people there because I want to order Care Bear flavor (cotton candy & wedding cake) but I don’t want other people to hear me order Care Bear.” When we got there, he was relieved that there weren’t other people around. He placed his order: “Can I get a small cotton candy mixed with wedding cake?” A few minutes later the guy opened the window with his snow cone in hand and said “Here’s your Care Bear”. Jackson was mortified. And we all howled with laughter. For the rest of the night, any time the girls saw somebody they said “Jackson likes Care Bears!” We all got a good laugh. October 11, 2010: At some point during the week Kylee lost her first tooth. It was one of the small ones on the bottom. It was pretty loose so Mel suggested that she tie some floss onto the tooth to pull it out. Plans didn’t work out as well as expected. She kept tugging on it but it wouldn’t come out and Kylee started crying. Unfortunately the floss was tied on really tight and there was no way to get it off, so she either needed to pull it out that night, or go to school the next day with a big piece of floss coming out of her mouth. I took some turns wiggling it, and Kylee took some turns wiggling it, and FINALLY it came out. Thank goodness. November 12, 2010: Mel made quesadillas for dinner and Kylee must have been pretty tired because she threw a huge fit when the rice was put on the side of the plate instead of inside the quesadilla. She was crying for a while and finally I told her she needed to go to timeout. Then she yelled “You guys aren’t the boss of me! Jesus is!” Mel and I both grinned at each other and bit our lips so we wouldn’t laugh. 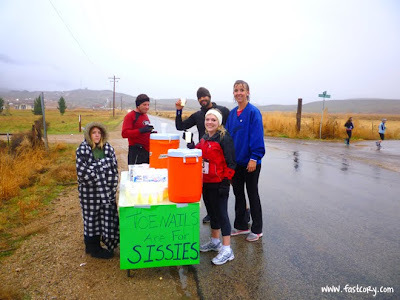 Eat a Hostess product at each aid station spaced 2 miles apart. 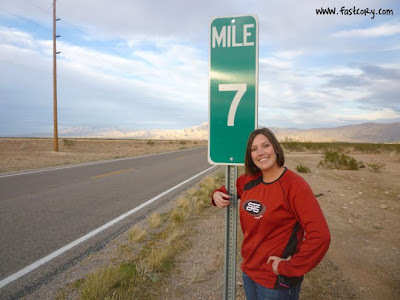 Use every ounce of will power available to not vomit Twinkies at mile 11. That, my friends, is the Hostess Half Marathon. As you can imagine, a race of this magnitude requires large quantities of Hostess. You have no idea the amount of suffering and turmoil I experienced having this much Hostess in my house and not eating ANY. As if the race wasn't challenging enough already, it rained all day. Fortunately rain isn't much of a concern when your primary focus is to not barf cupcakes. I am thankful the barf sensation didn't hit me until the last aid station. 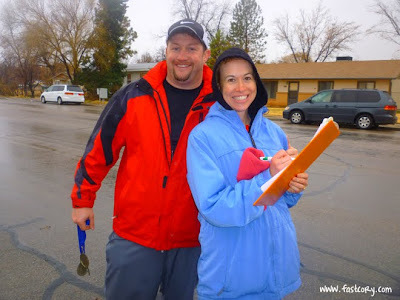 A few stalwart volunteers manned the soggy aid stations and for that they deserve at least seven boondoggle key chains. 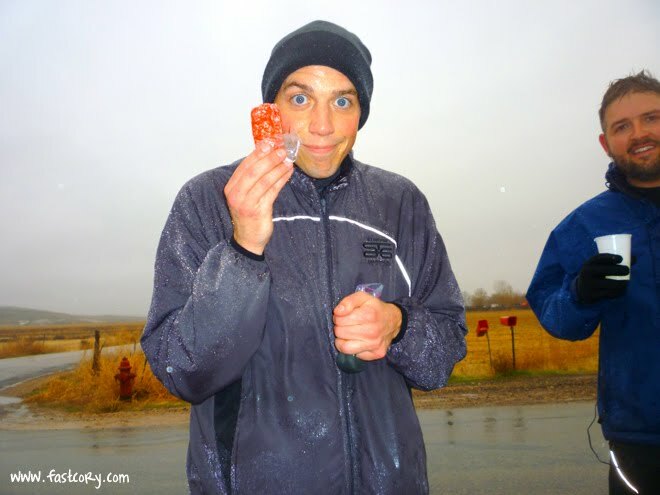 To tell you the truth, I loved eating Twinkies and donuts while running. But by far, my favorite running fuel was the mouth-watering Zinger. On the seventh day, God created the Zinger. I wish I had a nickle for every motorist who drove by and gave us a look of "What in the world are you crazy psychopaths doing?" I had a blast during the race and met lots of new people. There were probably half the runners I had never met before. I thought maybe eating lots of Twinkies, etc. 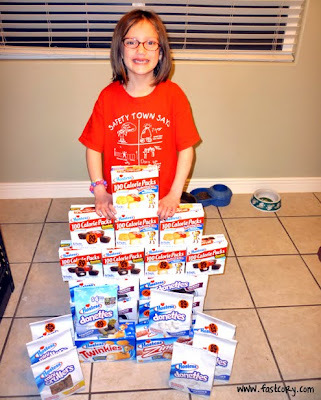 while running would make me sick enough to cure my addiction to Hostess. But, alas, it has not. If anything, I love it even more. Congrats to everyone for winning their age division (in months)! 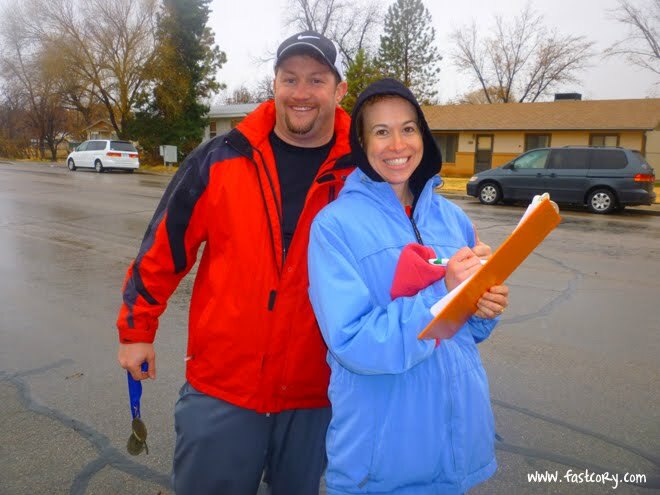 Extra special thanks to our spectacular race timers, Darin & Amber Larson who braved the cold and rain for three hours! We couldn't have been at the verge of vomit without you! Important Note: The Ironman World Championship in Hawaii will be televised this coming Saturday, December 18th on CBS from 2-4pm Utah time. Even if triathlons aren't your thing, this is something you don't want to miss. CBS does an incredible job putting it together with personal stories of what people have overcome. 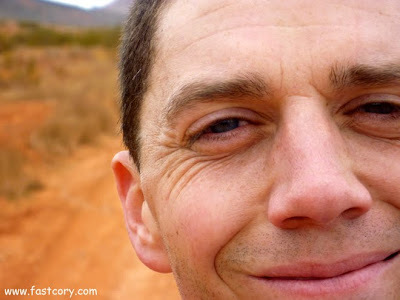 Monday, December 6th 2010: 4 miles @ 9:58 per mile pace. I did the usual hill route early in the morning. It was a little rainy and cold but nothing to whine about. 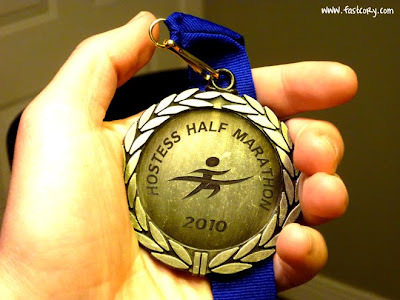 I continued my training for the Hostess Half Marathon by eating a 6-pack of donuts. Tuesday, December 7th 2010: 4 miles @ 9:27 per mile pace. Same as yesterday. 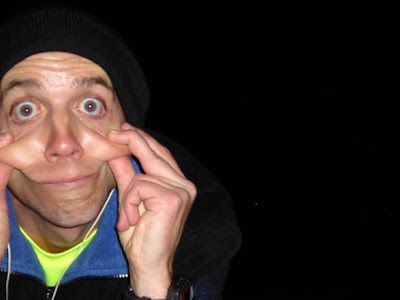 I've been using a head lamp lately when I run which I like although it takes a little getting used to before you stop feeling like you're running in a tunnel. Wednesday, December 8th 2010: 10 miles @ 9:53 per mile pace. 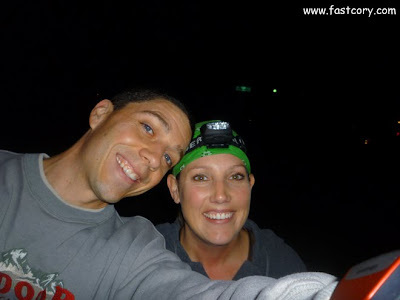 Yet another flashlight-free long run! For you locals, I drove to the dirt road which leads to Diamond Ranch Academy. The weather was perfect. The scenery was perfect. The only thing that wasn't perfect was my choice of hydration: a Camelbak. Since I'll be running more miles in the coming months I figured I should try some different options for packing water. I don't mind hand-held water bottles. I despise water belts. So the next possibility was a Camelbak (similar to carrying a 2 liter bottle in a backpack). It seemed like a promising alternative. Until I actually started running with it. The scenery along the run was absolutely incredible. I kept thinking over and over again how lucky I was to be running in a place so beautiful which is only a few minutes away from home. My Costco-special Camelbak had been sitting underneath my bed since approximately the time that Michael Bolton was cool. As a result, the water I put inside it tasted like it had been taken from a bathtub after just giving the dog a bath. But then.....I ate a Montana Huckleberry gel. The combination of swamp water and Montana Huckleberry tasted like a Duracell battery. 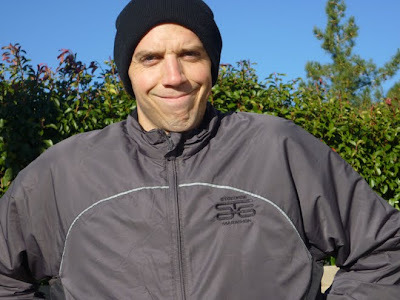 Thursday, December 9th 2010: 4 miles @ 10:33 per mile pace. I felt a little tired from yesterday's run so I did the hill route but kept a slower pace and didn't overexert myself. Friday, December 10th 2010: Rest. I realized this week how valuable rest days will be as I build mileage. I was thankful for a day off. Saturday, December 11th 2010: 13 miles @ 10:16 per mile pace. I just wasn't feeling it on this run. I felt sluggish the whole time and couldn't really get myself going. I've also had this little issue on the top of my right foot for a few weeks. I wouldn't call it an injury, but just an inconvenience. I'd say the official diagnosis is STT (Slightly Tweaked Tendon). Diagnosis courtesty of Dr. Reese, MD. It was bitter cold outside. I even saw icicles hanging from some barbed wire. Stay tuned for next week's complete review and pictures from the Hostess Half Marathon! "During 13 years of professional running, I never got it fully right. It's like golf. You'll never be perfect; you try to get a little better at every opportunity. That's the beauty of distance running, I think. It's a never-ending journey of trying to find out how good you can be, what I can improve on, even with my limitations. I'll never know the answer, but I'll keep looking for it." 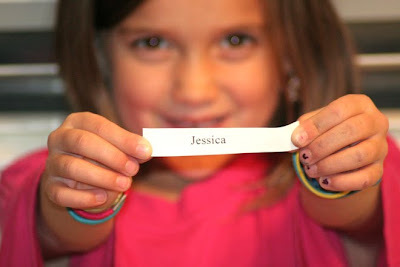 The youngster closed her eyes and picked a name out of the bowl. 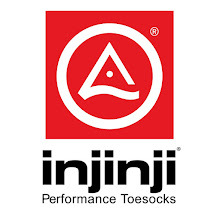 Congrats - may your arms always be warm and sweaty! 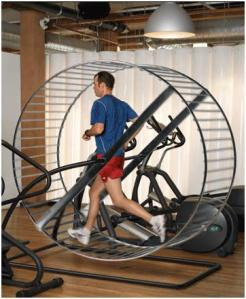 Monday, November 29th 2010: 529 miles on treadmill. Okay, it was only 3 miles. But it DEFINITELY felt like 529 miles. I detest the treadmill and haven't run on one for months but it was bitter cold outside and the wind was blowing like crazy. I regretted my decision to stay inside and be warm. I ran another 4 miles that night @ 10:19 per mile pace. Outside. It was freezing cold but the wind stopped so I was fine. 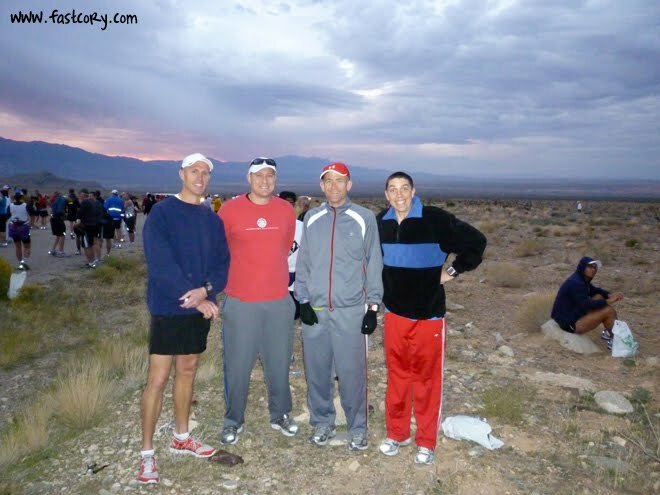 Tuesday, November 30th 2010: I stayed up until midnight when registration opened for the Utah Grand Slam (run 4 Utah marathons over the course of a few months). I am excited to report that I got in! Now I won't have to do my Almost-Grand-Slam. 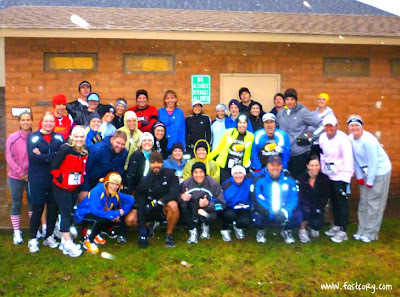 Wednesday, December 1st 2010: 10 miles @ 10:18 per mile pace. 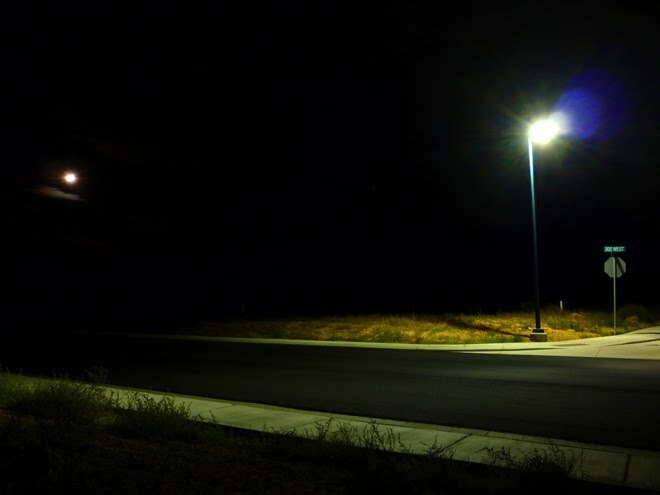 I was ecstatic because I was going to be able to do a run without a flashlight! Except for a few races, I haven't run without a flashlight for two months. With work and family, I need to run either really early or really late. But this day was a glorious exception. 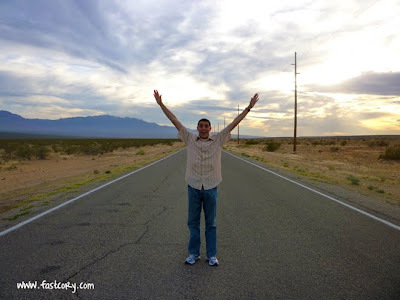 I wanted to go somewhere new, so I went to a dirt road past the Hurricane airport. I didn't know what to expect so I brought two hand-held water bottles which worked out okay. I really loved being out in the opened all by myself enjoying the scenery. I happened to come across a few cows who seemed a bit distraught with me disturbing them. But only one cow snorted at me. It wasn't nearly as scary as my last angry cow encounter. Thursday, December 2nd 2010: 30 minutes on exercise bike. Friday, December 3rd 2010: I took the leap of faith. 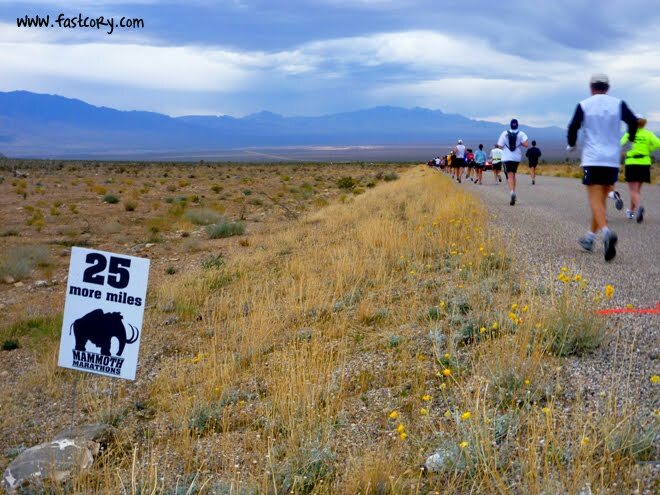 I pulled out my credit card and registered for the Buffalo Run 50 mile race on March 26th!!! I am SO excited to run my first ultra-marathon! I got butterflies in my stomach when I clicked the PAY button. No backing out now! The real training begins. Saturday, December 4th 2010: 11 miles @ 9:44 per mile pace. (Pace not completely accurate since it doesn't take into account my picture stops.) 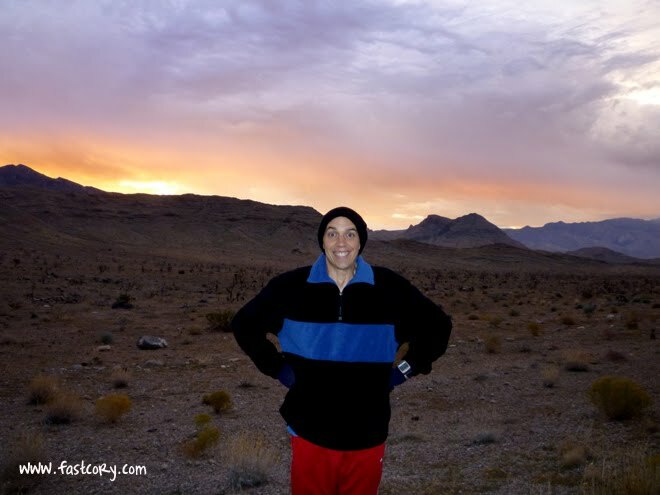 I went back to the same dirt road which was a blast, except that I had finished half the run before the sun even came up so it was pretty nippy outside. Speaking of nippy, Mel bought a new box of Western Family band-aids which I applied to the nip region as a long-run precaution. Whoa, mama. Those puppies are strong. When I removed them, I think 6 layers of skin came off with the band-aid. I believe I saw my lung. I felt surprisingly good the last five miles. Granted, I was getting tired and sore, but I still had some kick in me. That often isn't the case. It felt good. I will now sign off so I can perform first aid for my band-aid induced wounds. 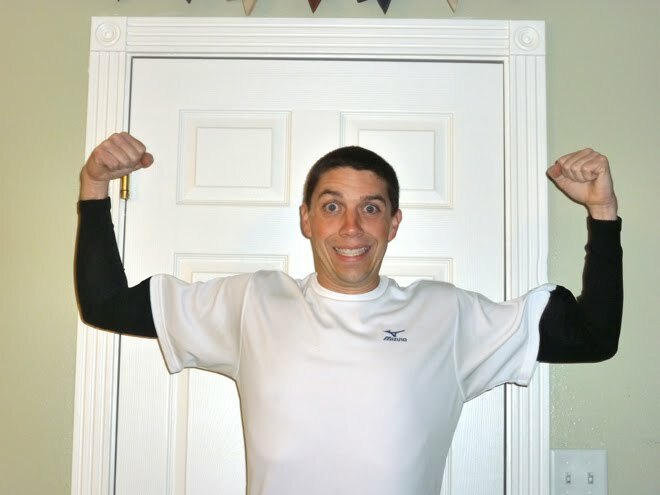 I had never used arm warmers while running because I thought they looked, well, sissy. But then I actually tried them during the Mesquite Marathon. They quickly became my favorite running companions. Previously I thought "Well, duh. Why don't you just wear a long-sleved shirt?" But then I realized that arm warmers are actually warmer and not nearly as bulky. They make your arms smile (if your arms happen to have lips and teeth). Because of a gracious gift from an arm warmer manufacturer, I am giving away a free pair of cozy arm warmers! 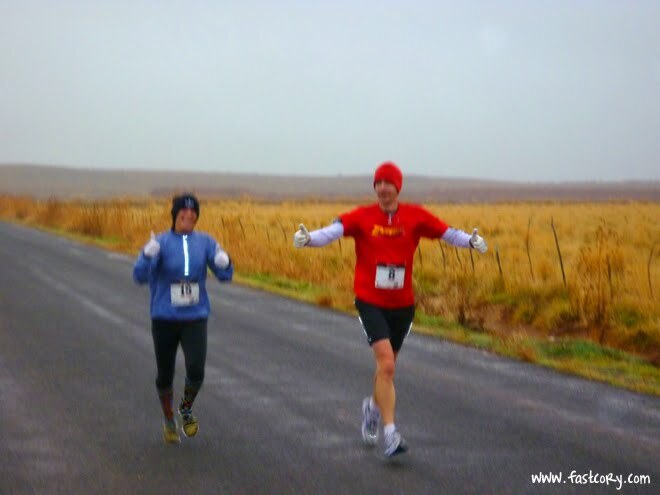 Yes amigo, you could be the proud owner of warm arms while running in the cold weather. I hear you asking yourself "Cory, how can I win myself a pair of them fancy arm warmers?" 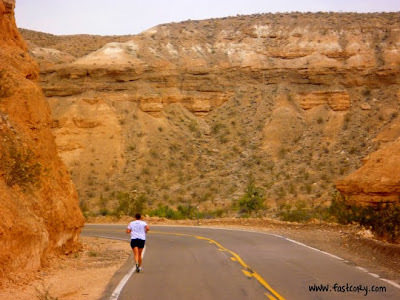 All you have to do is post a song you listen to on your iPod while you run. You get one entry for each comment so knock yourself out. The more song comments you make, the more chances you have to win. Winner will be picked at random one week from today on December 7th. I wish you luck fellow runners! 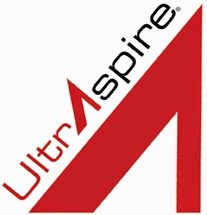 1) I am going to sign up for my first ULTRA-MARATHON!!!!!!! Originally I planned to do a 50k (31 miles) but decided to go big. 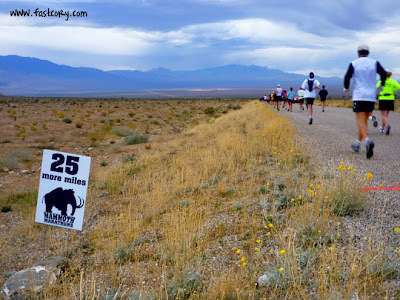 I'm going to shoot for the Buffalo Run 50 MILE race on March 26th 2011! 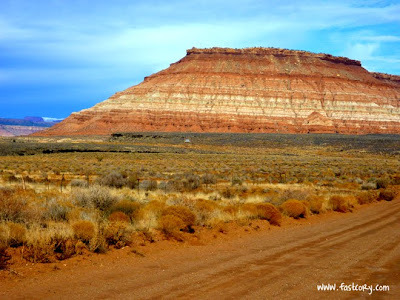 It is on Antelope Island in the Great Salt Lake. I am so excited about this. I wish it was next week. 2) You only have ONE WEEK to register for the Hostess Half Marathon! We need a count to order medals. The race is Saturday, December 18th. CLICK HERE for more information and to download the registration form. 3) The last time I won something, I was old enough to believe that Care Bears were real. I was at a grocery store and won a pineapple cake. I was not thrilled with the idea of sharing my loot with the rest of the family. The peeps at St. George Running Center will fit you with the most comfortable shoes your feet have ever had the pleasure of walking in. So go check them out right now. Seriously. Go. I'll wait. 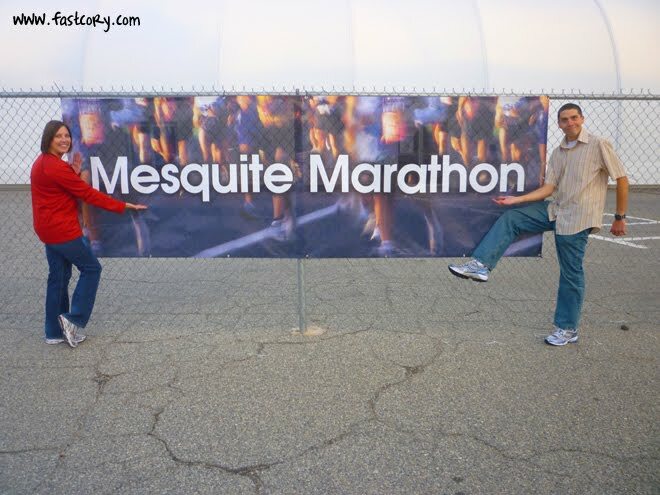 4) Check out this race review of the Mesquite Marathon from author Dane Rauschenberg who wrote the book One Man: 52 Marathons, 52 Weeks. 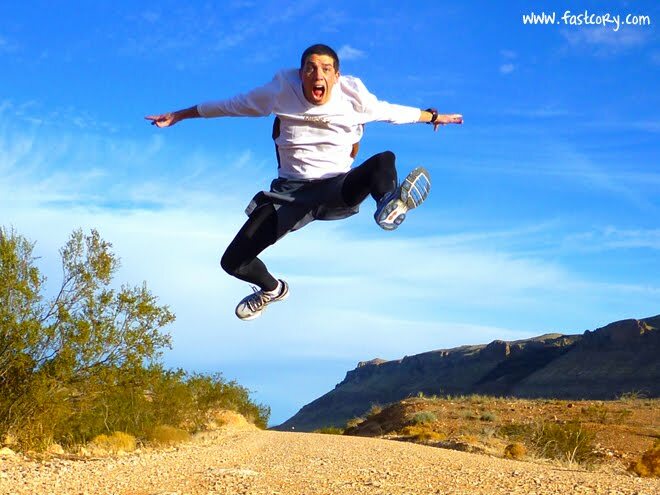 He gives a good description of the crazy wind, and you'll see a picture taken by yours truly. 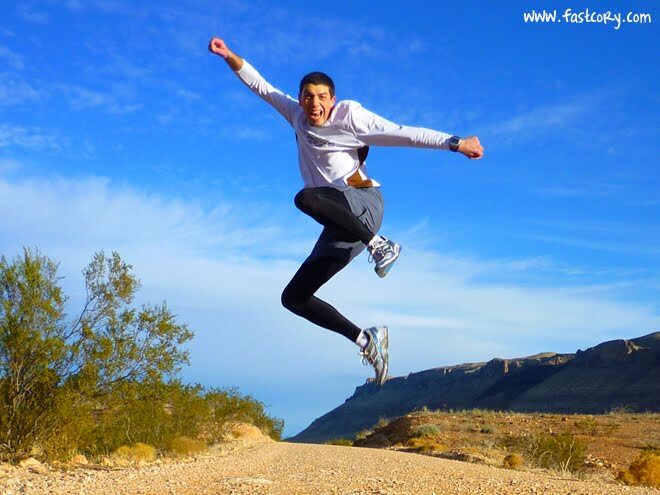 5) Anyone who runs will be able to relate with this short video clip called Why Do You Run? I think it's pretty sweet. Mesquite Marathon 2010: 4 hours & 32 minutes! We drove down to Mesquite, Nevada the afternoon before the race and thought it would be helpful to drive the last section of the course just to know what to expect. There were some uphills toward the end of the race which nearly made me whimper like a school girl. 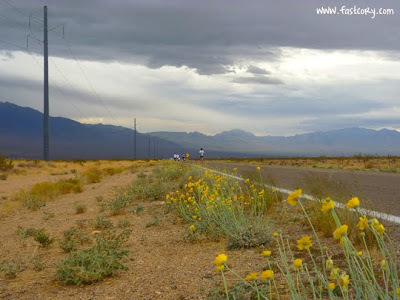 We snapped a few photos along the road while our friend Darin buried some Gatorade at the halfway point. It was deceptively beautiful outside. Mel was particularly fond of this sign near the beginning of the half marathon which she ran. One cool thing about the Mesquite Marathon is that you run through 3 States! 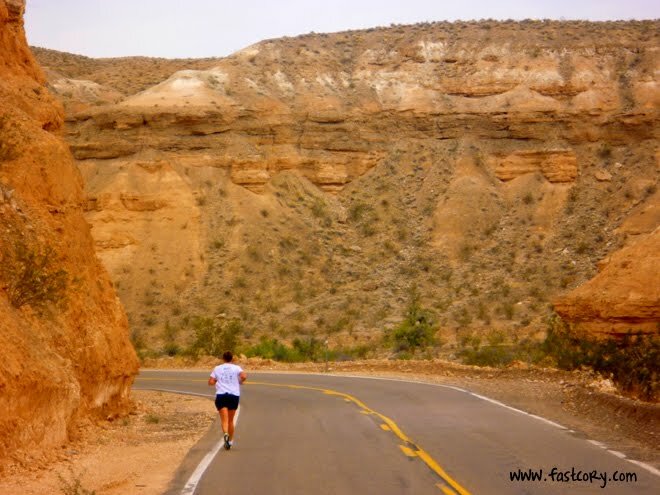 You start in Utah, run most miles through Arizona, then finish in Nevada. Packet pick-up at the Casa Blanca Casino the night before the race was simple and easy. Those cheerful, cheesy smiles are because the weather was still deceptively beautiful outside. Our shuttle to the starting like Saturday morning was a nice bus with the most comfortable chairs my rear end has ever had the pleasure of sitting in. Part of me wanted to just stay on the bus, even if it meant a prison-style brawl with the bus driver. 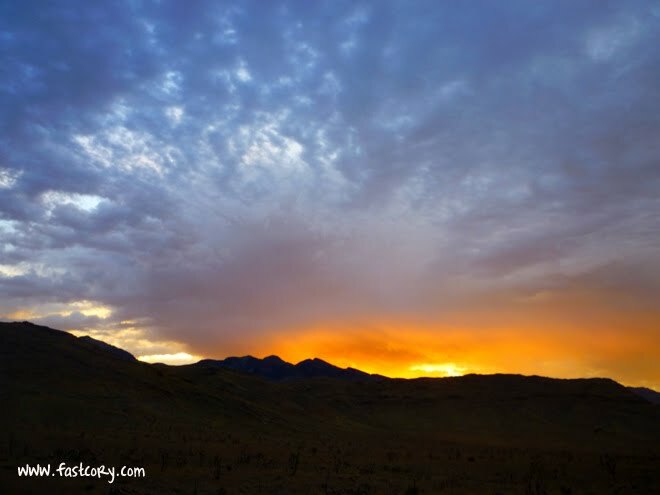 We saw an incredible sunrise as we waited for the race to start. 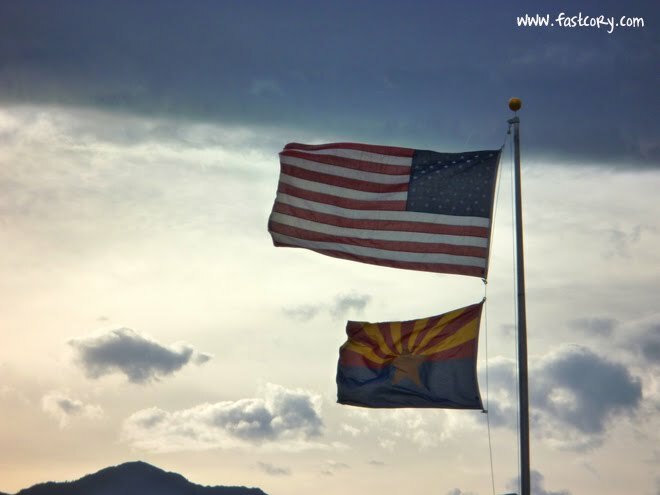 There was only a gentle breeze, but storm clouds were on the horizon. I maintained my tradition of wearing horribly mis-matched thrift store clothing to the race. I'm not kidding you - my son asked if I was wearing a Snuggie. Hanging out with my friends Glenn, Jason, and Darin helped pass the time and alleviate pre-race jitters. I started out feeling good, although within a few miles it started getting pretty breezy. 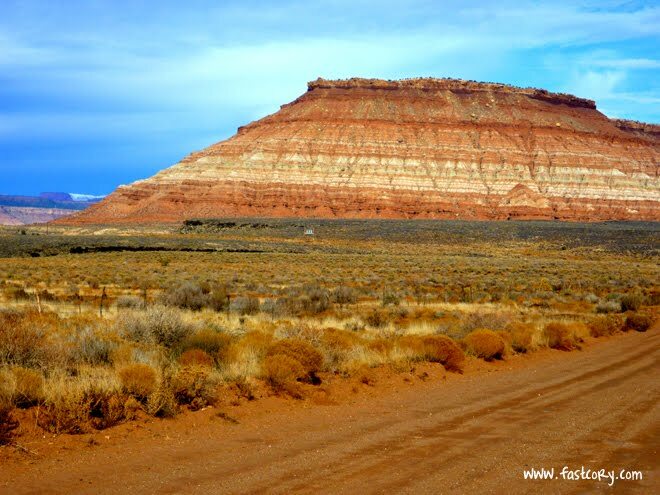 The vast expanses of desert were beautiful in a weird sort of way. I brought the trusty camera and took around 60 pictures during the race. 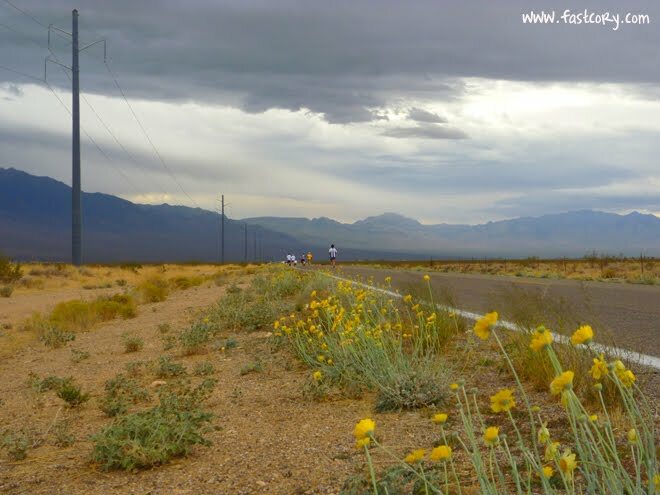 Around mile 5 or 6 I saw some yellow flowers that deserved a stop for picture-taking. It was around this time when things started to get ugly. You can see the dark clouds overhead. The wind started to get insane. And suddenly I wasn't having a ton of fun anymore. By mile 10 the winds were at full force. And as luck would have it, we were running RIGHT into the wind. 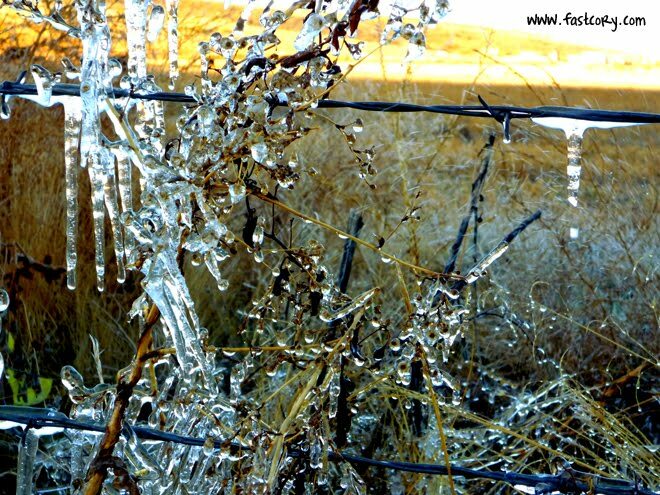 One weather report said the wind was consistently at least 35mph, but gusts were up to 50 MILES PER HOUR! We certainly felt those gusts. Water was streaming out my eyes, and if I could have scraped all the dirt out of my eyes I could have filled a sandbox. Or at least it felt like it. I tried to figure out a way to show just how windy it was. And then I saw some flags in the distance. Despite the wind, I was still feeling okay at mile 16 and had my second fastest mile of the race (9:03). 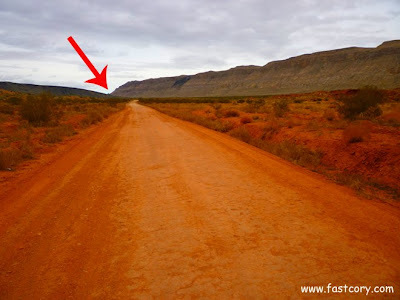 This little downhill into a canyon was the last section before meeting some of the ugliest hills I have seen in a race. 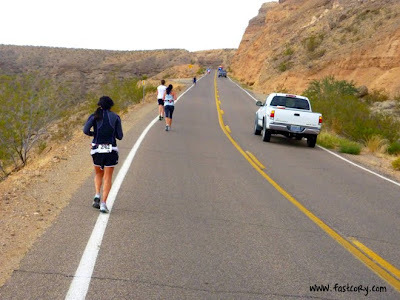 The Mesquite Marathon is a steady downhill course. Riiiiiiight. And I have a pet unicorn named Debra in the backyard. I actually felt good going up the first hill. I felt okay going up the second hill. The third hill was tolerable. 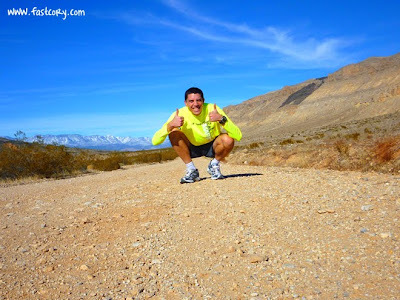 But after many miles of hills I wanted to yell at the pavement and say "STOP IT! Enough already!" 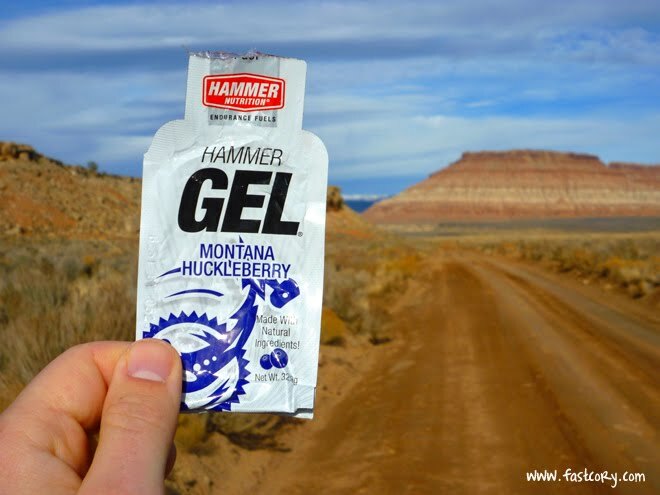 I heard so many swear words from other runners that it would make a sailor blush. For all I know, they buried the bodies of countless marathon runners who met their Maker on the side of those hills. Around mile 23 I realized that I was miraculously within the grasp of getting a marathon PR (4:25) if I just kept a moderate pace. (Spoiler alert: I didn't.) The hills and wind had beat me into submission and I just didn't have the juice to keep me going at that "moderate pace". I finished the race in 4 hours and 32 minutes. As the guy on Princess Bride would say, it is "Inconceivable!!" that I was only seven minutes off a PR considering the course and the wind being insane in the membrane. I felt proud of myself for making it through something so hard. I felt so deeply grateful for the body my Heavenly Father has given me. After six marathons, I still find it Inconceivable(!) that my legs can carry me 26.2 miles. At the finish line I saw a race photographer and tried to get a Jumping Jack picture. I managed to jump. But when I came down my legs were a little wobbly and I almost crumbled. A few people said "Whoa! Don't hurt yourself!" In retrospect, that would be pretty bad to say my running injury came from trying to jump at the finish line. The race volunteers were excellent. Post-race food was excellent. (I inhaled a few bagels and a scrumptious cheese Danish.) My only injury was a blister on top of a blister on my foot. (I'll spare you the gory details, but trust me when I say this is possible.) After running this race, the next marathon will be a breeze (no pun intended). 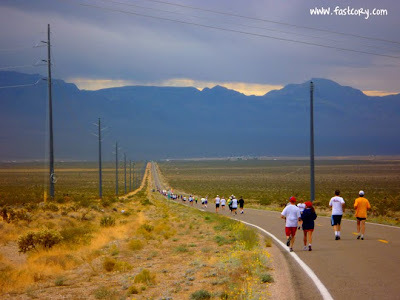 To stand at the starting line of a marathon is a spectacular thing to behold. I love the feeling of anxious excitement. The air is filled with nervous energy. Everyone is wondering “Should I line up with the crowd, or wait another 20 minutes in the Port-O-Potty line?” And then the gun goes off! Everyone yells with excitement! And then you stand there for another ten minutes waiting like cattle for the rest of the herd to start moving forward. The incredible thing about the marathon is that it isn't a race. It is an event. According to the National Institute For Fake Statistics, only 3.8 % of people actually “race” in a marathon. I am certainly with the 96.2 % of people who just show up for a good time. But for some people, this really is their idea of a good time. And it’s those people who fascinate me. I have learned that you absolutely can not judge running ability based on appearance. Because as soon as you start to get arrogant about your running ability, you will surely be passed by someone wearing a hamburger costume. 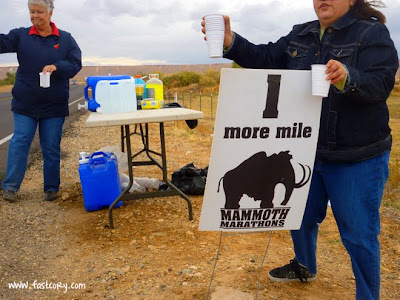 Side note: I saw him wandering around at the finish area of the St. George Marathon. I hurried (as fast as cramped legs can hurry after running 26 miles) in the other direction. To date, I have never been passed in a marathon by anyone wearing jeans or cowboy boots. Yet. 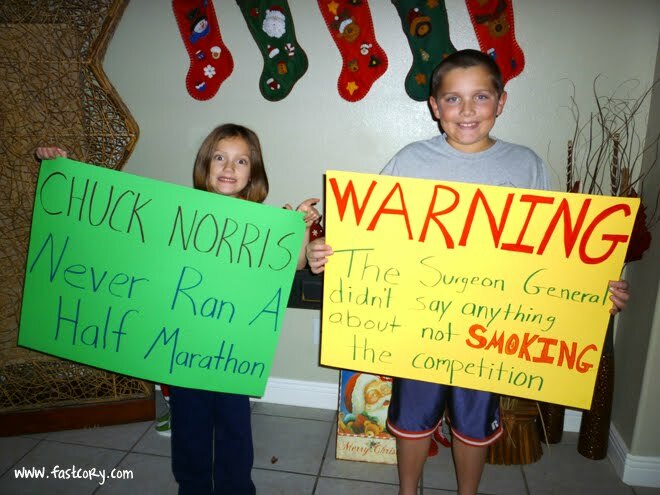 But my fastest marathon time ever is still slower than George W. Bush (3:44), Will Ferrell (3:56) and P. Diddy (4:14). I think Will Ferrell is very funny, but I can’t fathom the fact that my time was slower than his by almost a half hour. A half hour! This is what I love about running. It is the great equalizer. Everyone is on the same playing field. You just never know what’s going to happen on race day. Unless you were foolish enough to eat Mexican food for dinner the night before the race. Then you do know what’s going to happen. For 96.2 % of us, just crossing the finish line is a personal accomplishment. Nothing can match that sense of accomplishment. And if you can do it wearing socks and sandals, you have my utmost respect. 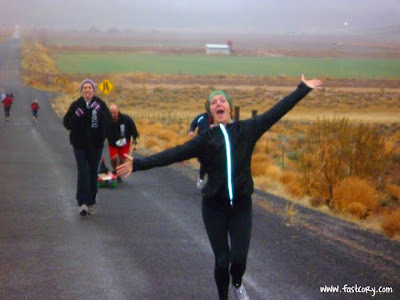 Looking for another reason to register for the upcoming Hostess Half Marathon on December 18th? Look no farther than THIS article from CNN. My brother forwarded me this story of a NUTRITION PROFESSOR (!!!) who lost 27 POUNDS (!!!) 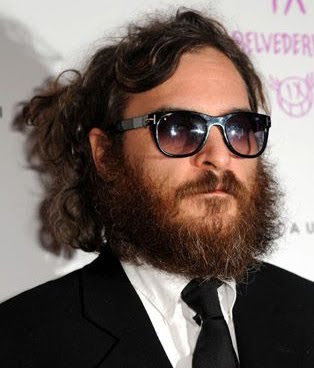 over two months on a Hostess diet. I ain't kidding you! Read the story. If it's on the internet, it must be true. Feel free to start your own Hostess diet during the race. To earn a medal, runners must eat a Hostess product at each aid station spaced approximately two miles apart. Pick your poison: we'll have Twinkies, Ding Dongs, and bite-size donuts. The deadline for race registration is December 4th. CLICK HERE for the link to the registration form. Bring your shoes. Bring your speed. Bring your appetite. If I could summarize this week of running into one word it would be COLD and WINDY. Wait. If I could summarize this week of running into two words, they would be COLD and WINDY. Monday, November 8th 2010: 8 miles @ 9:24 per mile pace. I had one of those rare Haley's Comet experiences where I felt so good that I ran farther than planned. I originally intended to do 6-7 miles but kept going, despite the rain which made me smell like a wet dog. 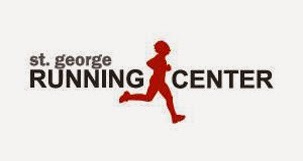 Tuesday, November 9th 2010: 7 miles @ 9:18 per mile pace. I was really hoping to have another experience like they day before when I felt so good. That didn't happen. I had a faster pace because it was insanely cold and I just wanted to get home. Wednesday, November 10th 2010: Rest. I felt so sick I was about to burst. "What in the world are you doing you fool?!?!? Running nine miles at 11:30 at night after just eating 19,000 calories for dinner is not going to help you ONE IOTA at the Mesquite Marathon next week. So just go home and go to bed dummy!" And so I did. Saturday, November 13th 2010: Aviation Nation air show in Las Vegas. 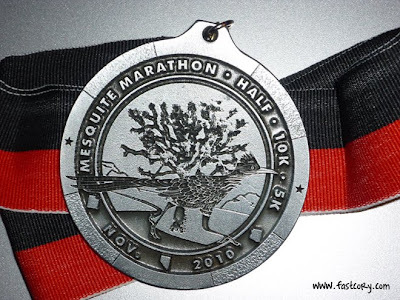 I am excited for the Mesquite Marathon next week. I drove the course a few weeks ago and was a little nervous about the uphills. I think it will be a challenging 26 miles. But then again, there is no such thing as an "easy" 26 miles.